West Cork has been described as 'A Place Apart', by location - tucked at the very south western end of Ireland. A long bony finger of land pointing boldly into the Atlantic Ocean, the Mizen is different. Magical names: Dereenatra; Knocknaphuca; Ballyrisode; Mount Gabriel, Fastnet Light and Heron's Cove. High hills, low mountains, rivers, streams, hidden valleys, soaring cliffs and sandy beaches and an ocean that is never far from view, it is the ideal holiday destination. Walker, swimmer, horseman, sailor, painter, golfer, writer, birdwatcher or just professional relaxer this is a place you could be happy in. The weather is mixed and rarely that cold. We enjoy summer sun and unseasonably good weather in spring and autumn. That said, we do rain rather well, mist and fog on occasions and, well, sometimes the wind can be spectacular. The Gulf Stream affects us and there are pockets of lush vegetation and microclimates. Each village along the Mizen has its own character from the quayside hamlet of Crookhaven with more pubs than shops and nearby access to the long, sandy strands at Barley Cove, Chimney Cove and the Shelly Strand www.crookhaven.ie. There is nothing better than a walk on the beach followed by an incredible crab sandwich in O'Sullivan's pub, whilst watching the gulls sweep up and down the inlet. From here you hit the N.71 the road which, if you like to tour, links you to Bantry and the Beara peninsula, The Ring of Kerry and Killarney, Skibbereen and on to Cork and the rest of the world. Kerry, Cork airports are roughly 85km. Dublin is roughly 400km and Rosslare ferry port 200 km. Bustling and busy, but not over crowded in the height of the season, the Mizen always has an attractive face. Spring, autumn & winter the pace slows and there is time for chat or an impromptu music session in one of the bars. Generally the weather is not unkind and the countryside is still beautiful. Spring presents us with masses of wonderful flowers in the hedges and meadows, by the seashore and on the high hills. In autumn the ditches and high places are ablaze with montbretia, gorse and bracken the colour of Harris tweed. A winter walk on a deserted beach and hot toddies beside a blazing fire are not an entirely unappetising proposition and prices are kinder outside the high-season summer months. This is one of the world’s longest and newest touring routes, stretching from Malin Head to the Old Head of Kinsale. It offers visitors many things to enchant and entertain; leading to hidden places along its winding path beside the wild Atlantic. 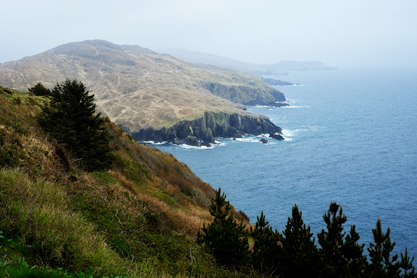 Along the way its rarest gem is the Mizen Peninsula. A long, spiny ridge pointing to America, punctuated by the lonesome Fastnet Rock, the teardrop of Ireland; the last light emigrants could see as they went westward to new lives. The Peninsula distils all that can be seen along the Way. So instead of travelling the long road, dipping in and out of 5,000 visitor attractions, stay here a while and savour this wild, unsung corner of the country.